The most frequently used method to fasten a sneaker to the foot so it won't fall off. The process of lacing a sneaker consists of passing the aglets through the eyelets in a defined pattern. Ironically, the "last" is the first thing that an athletic shoe manufacturer starts with during shoe assembly. The last is a jig, the size and shape of a foot. Sometimes, it's the foot of some alien being... given how some sneakers fit! It serves as a central form for shoe construction. After completing shoe assembly, the manufacturer removes the last. Australian tennis pro of the 1960's. His namesake adidas athletic shoes are unique among adidas styles in that they have no side striping. Any sneaker that you really like will be discontinued and the manufacturer will come out with a new version. The folks that work for Nike are really bad about this. The new version, of course, will be nothing like the old. Typically, the change will be radical: while the old version was a high-top, the new version will be a low-top (or possibly the opposite). Even the logo will be unrecognizable. Any sneaker that you detest will be remain available indefinitely. Eventual model updates will either fail to improve its shortcomings or make it even worse. A now-retired basketball player for the Los Angeles Sparks. She also won gold medals in the 1996, 2000, 2004, and 2008 Olympic Games as part of the United States basketball team. In the Baby Boomer days, what the young men at the good old school wore with great pride (some would say "arrogance") when they were stars at basketball, cross-country, football, track, or wrestling. Now, many schools have other popular sports, including soccer and volleyball. Now that young women are also jocks, they also get jackets... but they use the more politically correct term Varsity Jackets. 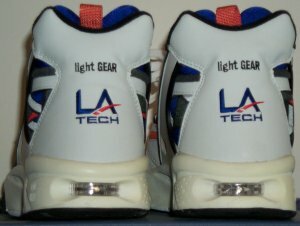 A sneaker made by LA Gear around 1993 that included interchangeable and replaceable light-emitting diode modules. Also, the user can replace the battery. To shut off the flashing light: remove the module, turn it over, and reinsert. I (Charlie) had a pair, but the midsole foam turned to powder. The subset of running shoes that feature light weight as a prime design directive. One frequently seen example is the Nike Presto. They are always available for kids... but not consistently for adults who want to be kids. Given the E-mail I (Charlie) get, there's a lot of chronologically grown-up people who want to be kids again. 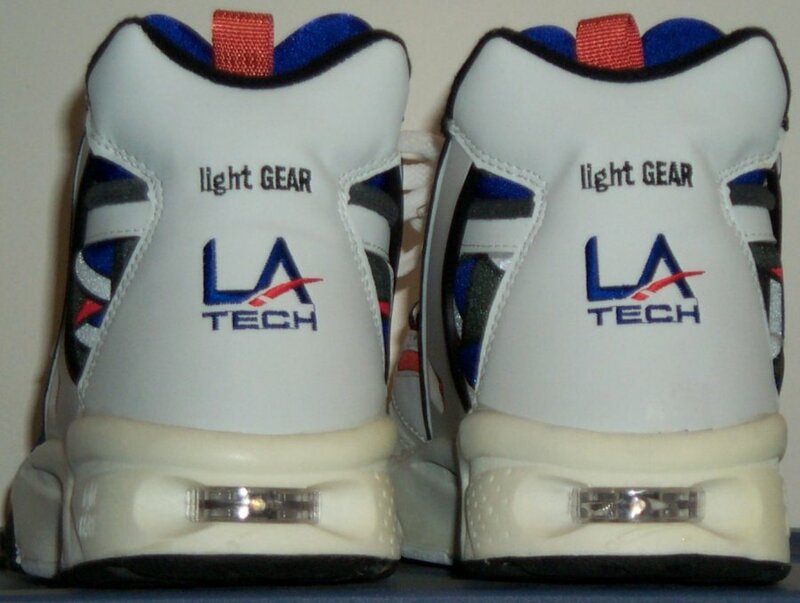 Inasmuch as I (Charlie) can determine, LA Gear is producing them again, but the price tag is in three digits. There are also some cheap ones shipped from China on amazon.com. The manufacturer's graphical symbol on a sneaker. Well-known examples include the adidas Trefoil, the Converse Star and the Nike Swoosh. Spatting is the mortal enemy of the logo. 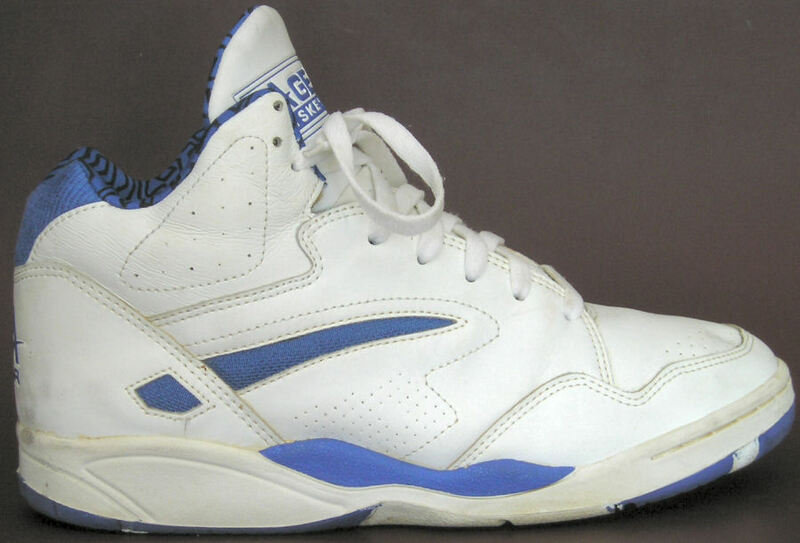 A sneaker that simply misses out on the ankle support a high-top provides, leaving the defenseless ankle to fend for itself. If the low-top has laces, it can also be called an oxford.